Pictured above is a controller we made recently for a gate which is to be opened at dawn and closed at dusk automatically. The controller is based around our standard REUK Dawn Dusk Relay Controller which uses a light detector and user calibration to detect the arrivals of dawn and dusk depending on measured ambient lighting levels. 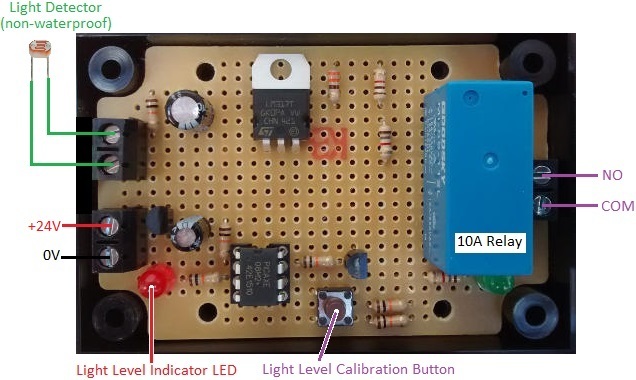 This particular unit is designed to control a large gate motor which requires two contacts on its electronics to be shorted out (connected together) for one second to toggle the state of the gate – i.e. open the gate if it is closed, or close it if it is open. When dawn is detected, the on board relay closes for one second which opens the gate. Then, when dusk is detected, the relay closes again for one second which closes the gate. The controller has a selection of timers and automation logic built in which prevent false dawns and false dusks being detected when there are clouds moving across the sun early and late in the day. If you need any kind of dawn/dusk detecting controller, email neil@reuk.co.uk with details of your requirements.